The customary teardown of the iPhone X by iFixit, within hours of its release, reveals Apple has made considerable changes to the internal design of the smartphone, including its layered logic boards and the use of two battery cells, a first for the product line. Just as it did with the iPhone 8 in September, aftermarket repair firm iFixit acquired an iPhone X in Australia to take it apart as early as possible. Unlike the iPhone 8, the teardown shows that Apple has altered many aspects of the design compared to previous versions, in order to incorporate its new technology. An initial x-ray of the iPhone X highlights Apple's use of two battery cells rather than a single component, maximizing the amount of available charge by using as much of the available space as possible, giving it a capacity of 10.35Wh. Rumors about the iPhone X suggested Apple would use an L-shaped battery, with the two cells connected together in the middle, making a similar shape. Another space-saving technique used is the logic board sandwich, with Apple minimizing the footprint of the board by effectively soldering two smaller boards on top of each other, using a third spacer PCB with through-hole vias to connect them. Compared to the iPhone 8 Plus logic board, the sandwich used in the iPhone X takes up approximately 70 percent of the space when assembled, but approximately 135 percent when flattened out. It is noted by iFixit that Apple has put considerable effort into cramming components onto the logic board, suggesting it to be unprecedented. 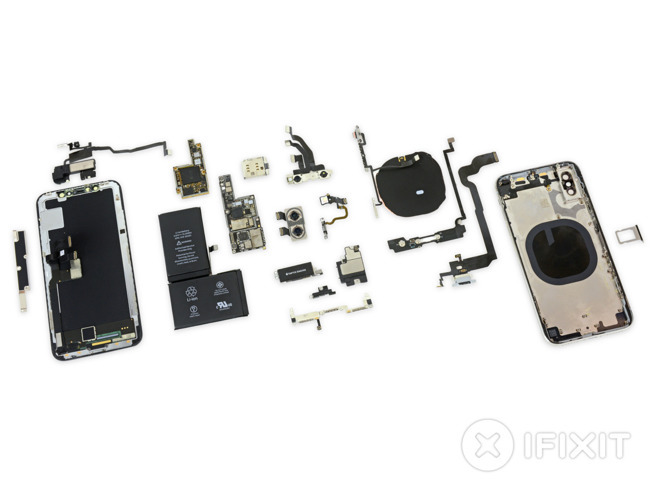 Due to the high density of components, iFixit suggests "ounce for ounce, even an Apple Watch has more bare board" than the iPhone X.
Apple has designed a large number of the chips used on its logic board, including the A11 SoC, the audio codec, power management IC, Wi-Fi and Bluetooth module, and the audio amplifier. Qualcomm also makes an appearance, supplying the modem and gigabit LTE transceiver, while other chips are provided by Texas Instruments, NXP, STB, Skyworks, Toshiba, and Broadcom. The iPhone X is held closed by unusual pin-like pentalobe screws which fastens onto the frame instead of the display, while leaving an unthreaded section for holding the display. It is thought this has been done to give the display some flexibility in its mounting, as well as making room for the Lightning connector. Opening from the side, there is a single bracket on the top surface that covers all of the logic board connectors, with other cables connecting the display assembly to the rest of the iPhone X. It is noted that the front camera array is mounted to the main casing instead of the display assembly, unlike earlier iPhones. The TrueDepth camera system is revealed to be in two parts, with the flood illuminator embedded in the display assembly, while the IR dot projector, IR camera, and front-facing camera are on a separate bracket. Once the logic board and battery are removed, the dual rear camera array is accessible, with it being supported by a foam adhesive providing a level of "airbag-style" protection. Heading towards the back of the assembly, the lower speaker enclosure is attached with adhesive for waterproofing, beside the linear oscillator vibration motor-based Taptic Engine. The Lightning connector is seemingly reinforced with a wider bracket, as well as through-holes to allow it to attach to the long pentalobe screws. The earpiece speaker on the display assembly has been redesigned with a duct to channel sound out through the screen. Also on the display assembly is a loudspeaker, microphone, ambient light sensor, flood illuminator, and proximity sensor, which iFixit says is "the most complex upper display component collection we've seen yet." In the middle of the back casing is the wireless charging coil, the side buttons, and a multifunction cable holding the quad-LED True Tone flash and the power button. The iPhone X has been given an iFixit "repairability" score of 6 out of 10. 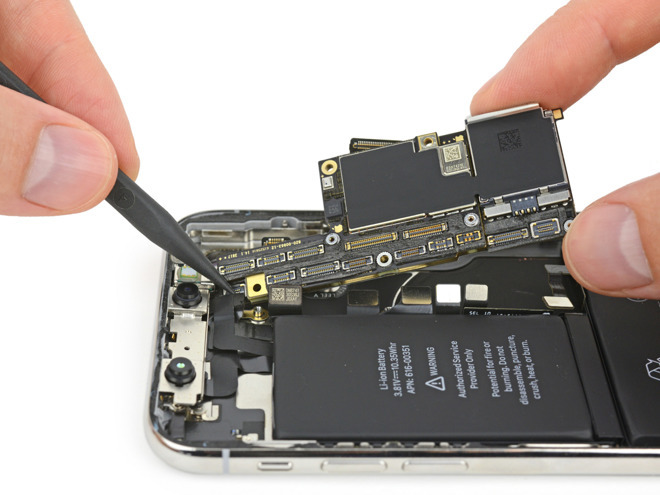 While Apple does score points for making it easier to perform display and battery repairs, as well as a cracked display replaceable without interfering with Face ID's biometric security, iFixit knocked down the score for its use of adhesives for waterproofing potentially interfering with repairs, complex and hard to replace cable assemblies, and the need to replace the entire chassis if the rear glass breaks.